Everest Base Camp Trek in November Doable? Home / 10 Best Treks in Nepal – The Ultimate Guide for Trekking in Nepal / Everest Base Camp Trek in 2018: The Ultimate Guide / Everest Base Camp Trek in November Doable? November is the last month of the trekking season in the Everest Base Camp. The autumn in Everest, which lasts from September to November, is one of the most favorable trekking months and the final month before which the winter starts off in the Everest region. 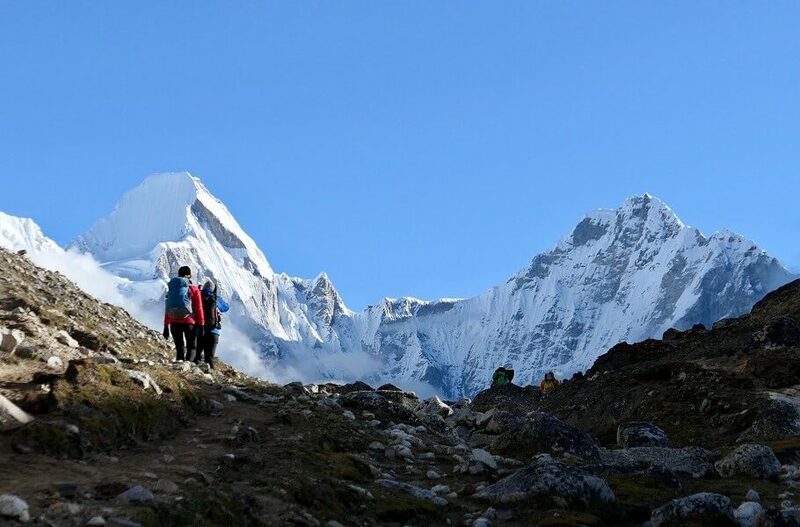 It shouldn’t come as a surprise that the Everest region is popular all year round because of the wonder, thrill and excitement it brings to the trekkers. But the number of trekkers in the month of November is astonishing. Moderate climatic conditions do come into the equation but there are plenty of other things to consider. The weather allows for some splendid viewing. Besides, the rainfall is the lowest of lowest of the year. 1. Will the tea houses/ restaurants in the EBC region be open in November? 2. Are guides/porters necessary for EBC trek in November? 3. What is the packing list for the EBC trek in November? 4. Do I need a travel insurance while trekking in EBC in November? 5. Should I consult a travel company before I go? Who does not tune into the weather conditions of the places they are going to trek? And you are no different. The comfort that you are going to have while trekking with regards to trekking is determined by the amount of sunshine, the maximum and minimum temperatures. And don’t forget the wind speed as well as the amount of precipitation. Let us look at all these factors in detail. The precipitation in this month is close to nil. So if you are looking for your treks to be free of rainfall, November is the season to go. The fact that there is no rain and the temperatures are small means that there you will have better grip with on ground while you travel. The weather makes it very easy for people to maximize their viewing experience and minimize their number of trekking hours/days that might be lost due to rain. Enjoy the company of many trekkers like you who are magnetized by the beauty of the Everest Base Camp and other places in its sight. The fact that the skies are clear make the views of Everest in the sunrise as well as sunset makes for a compelling view. With many places as packed as the Base Camp, you can interact with people in Namche Bazaar and other places in the Everest region. The Hillary school, as well as Tengboche monastery, will give you a glimpse into the faith of the region. Most Definitely!! The restaurants, as well as the tea houses, are open all year round. There might be some trekking trails that might be closed in the winters but November is hardly winter. In the final flourish of the autumn season in Nepal, trekking trails, as well as accommodation, will be available in plenty. If the number of trekkers is high, you might have to share accommodation some days. Yes and No. If you ask me,”Is it impossible to trek without guides/porters in EBC in November?”, I will say NO. But if you ask me, “Should I hire a guide?”, I will say YES. If you are a beginner who has come in the Everest region for the first time, guides are close to compulsory. Even if you have trekked in this region, you should hire a porter/guide. With so much the guides can offer you in terms of physical/mental assistance and guidance, I wonder why people don’t take guides/porters with them. Besides, they come very cheaply and there is nothing better than helping the local economy of the region. Packing things and storing them well is a key to having safe and wonderful trek. Backpacks that are commodious to accommodate your belongings and feel comfortable while carrying are of utmost importance. You’ll also have to consider spending and spending wisely on your base layer, insulation and the outermost layer of clothing. Woollen gloves, scarfs, socks, and hats are something without which you cannot complete your trek. Any insurance you have is a good insurance because you can never prepare fully for bad moments. Insurance for the EBC trek is cheap. Around 150US$ will keep you insured for around 30 days. Different insurance policies cover different items. Some cover your health issues such as altitude sickness, some cover flight delays, some cover travel theft, and some accommodate all of the above. Check what things are insured in your policies. A detailed guide to insurance for the EBC trek can be found here. It is always advised that you consult a travel company in Nepal before your trek. Many travel companies provide offer excellent services to you. The guides and porters that these companies will assign to you will be licensed. This will also reduce the chances of robbery/theft. And since there are various travel companies, you can choose from a list of guides whom you feel comfortable with. Jiri, a place that is accessible from Kathmandu by a bus, is the starting point of this trek. Unlike normal treks in the EBC region which start in Lukla, this trek starts at Jiri and quickens the possibilities of acclimatizing. This trek lasts for more than 20 days and therefore will require extensive training. You will find the details of your training schedule here. One thing that wouldn’t want to miss out on when you come for trekking in the Everest region is the splendid Gokyo valley. The Gokyo Valley and Renjo La Pass trek will also take you to the wonderful pass of Renjo La Pass as well as take you to the majestic lakes and mountains in the Gokyo region. Helicopter trek is one of the shortest treks in the Everest region. It lasts for a mere 9 days. And Yes, you will go to the Everest Base Camp and Kala Pathar. But you will go there in a helicopter after trekking for a few days in Lukla, Phakding and Namche Bazaar. November is the last month of the year to trek if you are looking to avoid the winter that sets in December. The fellow trekkers in the region are bound to make you feel safe and offer great conversation as well as make memories in the trip. So get rolling and start your trek to the EBC in the month November.